Pop over to Etsy and do a little shopping sometime - and if you do, stop by and say hello to me too! What a lovely blog, Thanks so much for including my poppies! Aren't people so creative and amazing? How neat! LOVE! Thanks for including our slip in your post. You have a great shop on etsy as well! 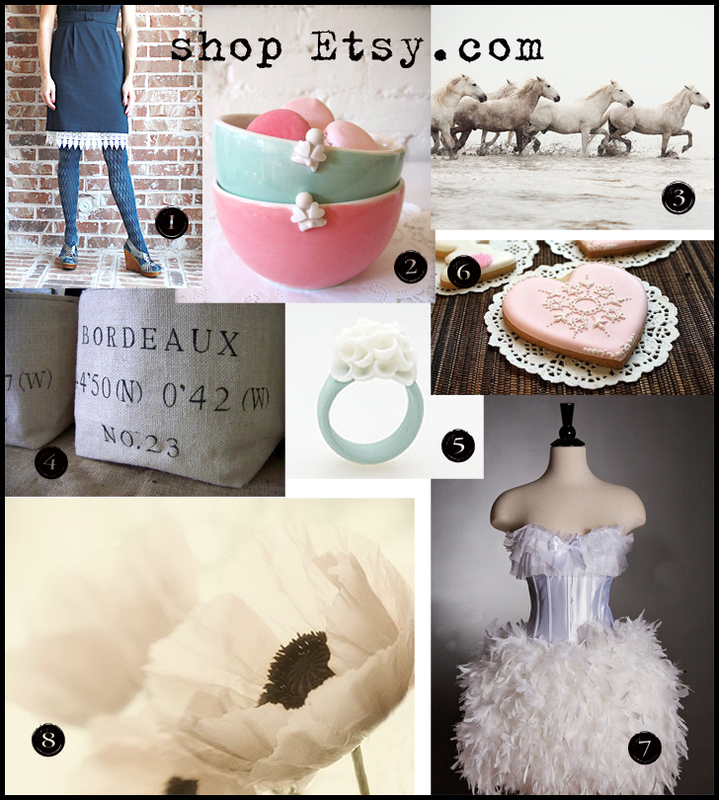 What a good idea to feature Etsy shops. I periodically browse other Etsy shops and have bought from a few of them, lots of lovely and interesting items and no having to bid to buy something! Lots of reasonable prices! The cookie looks too good to eat! What fun I've had following all the links and favouriting many on my Etsy account. How amazing is that Glamastick feather dress?!? If only I had the figure it could be the ultimate wedding dress for this lass who loves the feather white! I like when you blog about your shop, where you find the objects for your shop and things you like. A blog I follow "Lillalotta" she post her ideas, new art, family and beautiful countryside. She mixes it up. Love that fun dress...now I just need an excuse to wear it! haha What great finds! Thanks for sharing...love that ring too! So gorgeous and glam, loving that blue dress, the lace? detail on the bottom is fabulous! And where could I wear that feathery number?